The squares are the approximate colours of doors to where I've lived, apart from the last two, which are the average colour made from combining the other colours. I tried to remember everywhere I ever lived, and tried to find photos of them all on Google Streetview. Remembering where I lived was challenging and then finding them on Google Streetview was also difficult, when I didn't really remember what most of the houses looked like. I had to look through old emails, while looking for addresses, and they contained conversations from past relationships, which made me sad to read. I mostly seemed to tell people my address when I was looking for a job or hoping for a postcard. The picture on Streetview of where I grew up was taken when my father was still alive, and his car is parked in the drive there, and that made me tearful. For every address I looked up, I remembered the circumstances that led me to live there, and it was quite an emotional experience, looking at those houses. I was looking to see what colour the doors to the houses were, and in quite a few cases, they were hidden or blurred, so sometimes I searched other images, or just chose something approximate. If it was a block of flats that I lived in, the picture was just of the outside of the building, not the door that led into my flat itself. 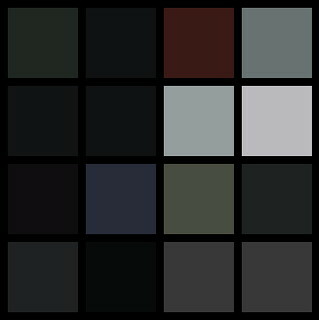 I created a grid in GIMP, and then used the colour picker in GIMP to grab a colour from each door. Some of the doors were actually a lot more white, black or brown than they have appeared in the grid (the perils of picking just one colour per door! ), and some of the doors were actually glass, but you can't tell that from this. The average colour was created by summing up all of the red values of the colours and then dividing by 14, then the same for the green, and the same for the blue values.